Analyses that evaluate the success of HBCUs by observing their six-year graduation rates often miss the mark. On the surface, graduation rates tell us little about a college’s or university’s ability to educate a racially and economically diverse student body. Few colleges and universities educate a majority low-income student body and also graduate the majority of their black students, according to my most recent analysis of the Integrated Postsecondary Education Data System. In total, less than 1 percent of all universities and only 5 percent of all HBCUs fit the following criteria: are 4-year institutions, have a black student enrollment that is more than 249, serve more than 50 percent Pell-eligible students and have a graduation rate for black students that is 50 percent or greater. Georgia State University, which has a black enrollment of more than 11,000 students, is the largest state university on the 50-50 list. GSU’s success is not through happenstance, and entails two key strategies. First, they use predictive analytics to identify students who might be at risk of dropping out. The analytics use technology to create profiles of students based on more than 10 years of student data. Second, GSU uses targeted interventions, including micro grants and counseling, to address students’ needs based on the predictive analysis. The top three universities for graduating black students within six years are Yale (98 percent), Harvard (97 percent) and Princeton (97 percent). There is no gap in graduation rates between black and white students on these campuses. However, we must consider other factors before lauding their success. The acceptance rates at these schools are between 6 and 7 percent; the total black population on campus is between 5 and 6 percent; the annual tuition and fees total between $42,000 and $44,000; and the percent of students they serve that are eligible for the federal Pell grant is between 13 and 14 percent. Of 23 colleges and universities in the nation that have graduation rates for black students in the 90s, the average annual cost of tuition and fees is $43,700 and the average percent of the student body that is Pell eligible is 15 percent. By contrast only five HBCUs have an annual tuition that is greater than $20,000, and the average percent of the total HBCU enrollment that is Pell eligible is 72.8 percent. No obvious thread links the institutions on the 50-50 list. Most are smaller, lesser known colleges and universities, which might have the advantage of educating low-income and black students in an intimate learning environment. Some of the colleges concentrate on a niche, which typically attract older and more-focused students. Other institutions on the list, such as Berea College, have a long-standing mission to provide educational opportunities to top-performing, low-income students. Among the institutions that educate students in a traditional learning environment, more than 25 percent of the list are HBCUs. HBCUs have a clear role to play in creating models to graduate low-income black students. 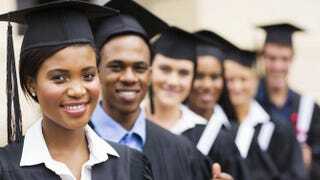 If one were to expand the 50-50 list to 50-40, which would include institutions with a greater than 40 percent graduation rate for black students, 14 additional HBCUs would make the list, including: Xavier University of Louisiana; Winston-Salem State University; Johnson C. Smith University; Dillard University; Bennett College; Philander Smith College; North Carolina A&T State University; Tuskegee University; Claflin University; Albany State University; Florida Agricultural and Mechanical University; Elizabeth City State University; Virginia State University; and North Carolina Central University. However, what is more impressive is that the collective average for Pell eligibility at these 14 HBCUs is 72.2 percent. On Thursday, the president, vice president and first lady hosted the second College Opportunity Day of Action in Washington, D.C. The event focused on building networks of colleges around promoting completion and increasing the number of college graduates in STEM fields. The event supported efforts to realize the president’s commitment to helping our nation lead the world in college attainment by 2020. However, status quo higher education in the United States has a very disappointing record of graduating low-income black students. Without context, the high graduation rate for black students at more selective and more expensive PWIs and HBCUs can lead to erroneous and naive conclusions about what low-income black students need to graduate from college. The 50-50 club demonstrates low-income black students are graduating from some of our nation’s least celebrated institutions. Incorporating their models into best-practice strategies and policies will be key to erasing the college education gap, which has its roots in systemic economic inequality.